It’s been a bit since we last shared an adventure to a National Park. As mentioned before, Bill & I are big fans of the National Parks and have a life goal of visiting all of them and getting a stamp for each in our passport. Bill getting a stamp cramp for all the stamps they had! Well if you have considered starting your own passport journey, then you may want to start in a place like Washington, DC. Why? Because it’s one of the mega-load hot-spots of stamps! When you think of DC what comes to mind? Monuments and museums, right? Well ALL of those monuments are part of the National Parks system and each of them has a stamp! Even places like the George Washington Memorial Parkway leading into DC has a stamp. There’s the National Carillon, Washington (the pencil one), Lincoln, Jefferson, and even Martin Luther King now has a monument. And that’s just to name a few! What’s better? In many cases, as the monuments themselves don’t usually each have their own visitor’s center, the stamps are often centrally located. Want to get a sweet haul of stamps at one go? Head to the visitor center in-front of the Washington Monument and you will easily walk away with half a dozen stamps. Bonus – the AC is usually on high in the Washington Monument Visitor’s Center, so it’s a welcomed break from the summer heat too! What’s the best way to get around and see all of these monuments? Bike it! There are many monuments that aren’t too far apart, though the majority of them are around the National Mall and tidal basin. To see them all you’ll be walking ALL OVER the city. 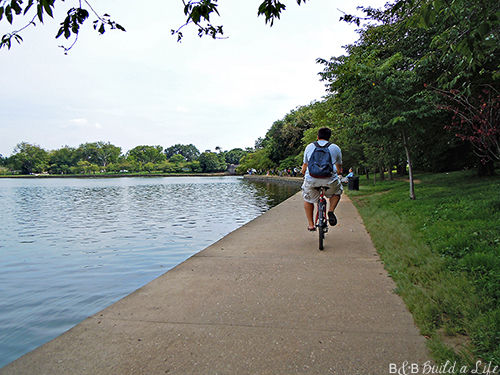 A quick spin across the National Mall on your bike will take no time at all. Though you may want to stick to your feet if visiting during the Cherry Blossom Festival as the crowds are in full force making biking difficult. Do take note not to ride your bike through a memorial or monument though as it is both not allowed, but also disrespectful to the memory of whom the monument is for. Simply dismount and walk it through, or leave it at a nearby bike rack. One of my favorite bike-to monuments is the FDR memorial. Instead of the memorial being a single statue, it stretches along the basin allowing visitors to meander through and rub FDR’s pup’s ears, or stand in a bread line, or enjoy a few of the fountains too. As for when to visit DC? Keep in mind, much of DC used to be swamp lands, so summer means it is incredibly humid. Spring and Fall are more comfortable times of the year. If you can’t help but visit in the Summer, you can beat some of the heat and save your monument visits for in the evening. The National Mall is one of the most patrolled areas in DC (the President does live around the block after all!) so a nighttime stroll is actually a perfect time to take in the sights. 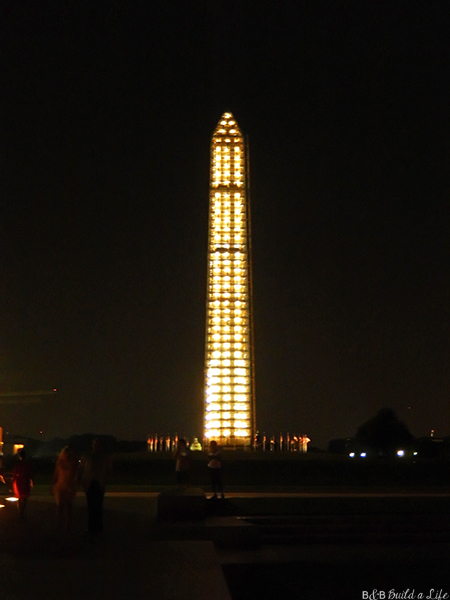 In many cases, the nighttime lighting of the monuments makes them even more dramatic than during the day. That’s especially true of my all time favorite, the World War II memorial. 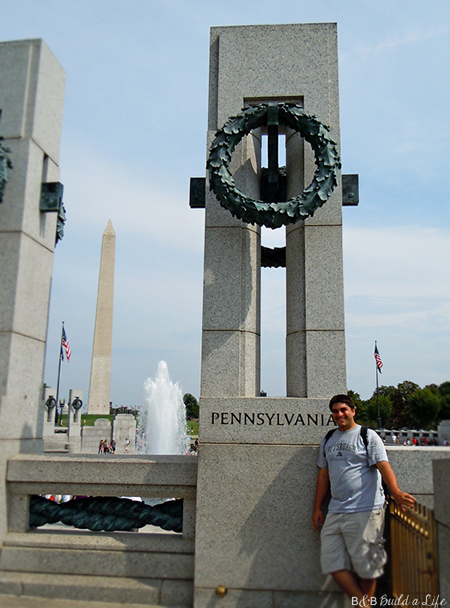 This monument is one of the newer sights on the mall, and also offers a nice way to cool off. Bill & I like to stop here with our feet in the water to enjoy our packed lunch. Don’t forget some of the off-the-beaten-trail places for stamps in DC too, like Ford’s Theater. Glen Echo Park is another stop for a stamp, and not too far up the road from there is the Clara Barton house. She founded and in may ways completely funded the Red Cross in the early days, and it’s a great place to learn more about her and her work. Though if you asked Bill, he’d also tell you it’s the creepiest park we’ve been to so far. The home is an old Victorian with a heavy musty smell. To save money, Clara used extra bandage material to cover the ceilings and other areas. BANDAGES. It served a great purpose, but was still a little weird. Glenn Echo park isn’t quite as creepy, and is actually a popular place to rent for a wedding reception. We were just fond of the carousel. So do yourself a favor and start your National Parks Passport journey in DC. When you can flip open your book and see allllll those stamps, it feels good, and helps to really egg you on for more. Seeing all this makes me miss being so close to all those sites. There were nights when I would literally just hop in the car and be downtown. Like election night. What better time to be in front of the white house than on election night? Have you been to DC? What was your favorite spot?